Anna Posey is the pastry chef at the Publican and Publican Quality Meats. WEST LOOP — The upside to being friends with a pastry chef often involves copious samples of cake. Anna Posey's friends also get art. Posey's ink sketches and watercolor paintings of fruits, gourds and other edibles — done off the clock from her job as pastry chef at the Publican and Publican Quality Meats in the West Loop — have made fitting gifts for friends and family over the years. Recently, when Posey started posting photos of her artwork on Instagram, friends of friends and, increasingly, random people took notice, asking for more. Encouraged by the restaurant's PR team, Posey set up a website in March to sell her art, which is inspired by what's in her cupboards at home and at work. "I'm like, 'Anna, people would buy these,' " said Jenna Liberman, marketing and public relations director for One Off Hospitality, which runs the Publican, Blackbird and several other restaurants. For Posey, 29, painting and drawing come naturally. Her mom is a painter and graphic designer. An uncle and some cousins are artists as well, as is her brother-in-law. As a kid, Posey said, "I was always art-focused. I never thought about anything else." She attended the Milwaukee Institute of Art and Design on a scholarship, majoring in painting and drawing. Job-hunting with an art degree proved less than fruitful, however. "For months I was looking and the best I could do was retail at Urban Outfitters for minimum wage," she said. Posey knew she was meant for hands-on work. She always loved to bake, but fashion, design and urban farming also interested her. She did a one-year stint at a parks program in Delaware for Americorps before having what she called her light bulb moment — pastry school. "It was something that as a career was challenging like painting and drawing, but also something I could do for the rest of my life and that could evolve as I go," she said. Posey has been the pastry chef at the Publican since 2012. During that time, she kept her artsy side mostly under the radar, preferring to paint at home on huge canvases for no one but herself. She was a tough audience. "I had [the canvases] facing the wall because they were so ugly. Nothing was really working," she said. But after moving into One Off's new baking facility on West Lake Street in January, she had another light bulb moment. "It's facing south and has amazing windows, amazing natural light. And I'm working with food all day, and the light is shining down. I started taking photos with my phone and got really excited and thought, I can meld my pastry and art together. I don't have to separate them," she said. If you've shopped the sweets section at Publican Quality Meats, you've seen Posey's doodles. She makes the labels for the caramel sauces and Pub Pop and Pub Chipper ice cream treats sold at the shop. 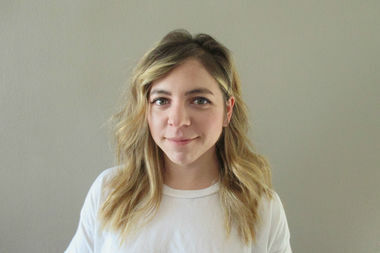 She has illustrated T-shirts and fliers for some of One Off's sister restaurants and did the brochure for the upcoming Momofuku pop-up dinner at the Publican, 837 W. Fulton Market. Posey is selling a handful of originals and prints on her website. She will do commissioned works. She described a current project measuring 3-by-5 feet as "almost a quilt of pomegranates and other fruits." "She's incredible," said David Posey, who proudly tweeted about his wife's side venture. "She will come home from a 12-hour work day and still manage to draw for two hours sometimes. I can't say I don't get a little jealous, but it's worth seeing the reward. It makes her happy." Practicing her art makes her pastry better, and better-looking, she said. "I love seeing a plate come together as it would in a drawing or painting. Both deal with placement of objects, lines coming together into a form, color and texture," she said. "Just like art, people are so moved by a beautiful plate of food."